Because it was my birthday a couple days ago. I turned 29. Seemed fitting for a sprinkles party! I made Birthday Cupcakes with Sprinkles. Made these Sprinkles White Chocolate Truffles. And made this cake right here. 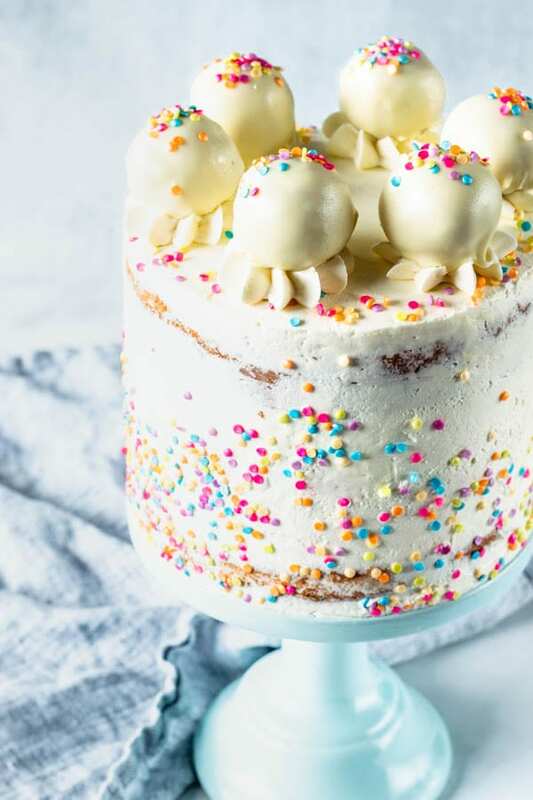 This Birthday Sprinkles Cake has a Cheesecake Filling. It’s covered with Italian Meringue Buttercream. And finally topped with Sprinkles White Chocolate Truffles. What kind of sprinkles do you use to make Sprinkles or Funfetti cake? Well, here’s what I will tell you. Always use Jimmies ! I usually use Wilton brand but CK brand isn’t too bad either. I’ve used a lot of their sprinkles. However, when I went to make my Birthday Sprinkles Cake, I sadly realized I was left with only nonpareils sprinkles. I had ran out of the jimmies! I had no way of going to the store, and my batter was almost ready. Which comes to teach us all a lesson! Mise en place! Always always gather your ingredients together before starting a recipe! I should have known, since I’ve made this mistake other times. But I was so busy and trying to concentrate on so many things at the same time, that I was stuck with my mistake once again. So, my batter got a little stained from the nonpareils melting. Which was fine, but not really. The taste was fantastic, but the perfectionist in me wanted to cry and bawl once I cut into the cake. Anyway, lesson learned, moving on! This is the Sprinkles brand I used for the outside sprinkles on this Birthday Sprinkles Cake. It’s the Shimmer Sprinkles by Chocomaker! And I absolutely love them! This was really the Birthday cake of my dreams! The cheesecake filling is something I’ve been wanting to do for a very long time. 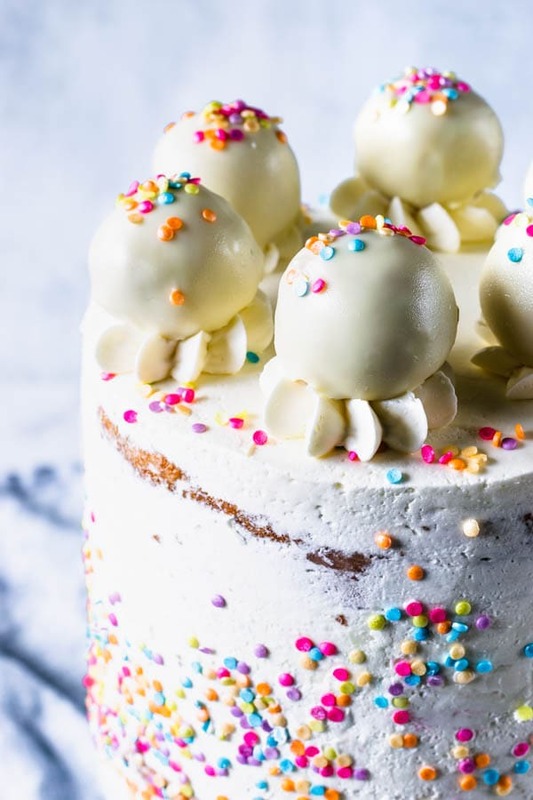 And the Sprinkles White Chocolate Truffles really are something to write home about! And here it is! I hope you like my Birthday Sprinkles Cake as well! Don’t forget to brush some simple syrup on the cake while frosting. I always like to bring that up because it’s such an important step in achieving a moist cake. To make simple syrup, simply bring to a boil equal amounts of water and sugar. You’ll probably use about 1/2 cup of syrup to brush on a cake this size (6″, 3 layers). However, you can always make more and just store in your refrigerator. It will last indefinitely. Just don’t get any cake crumbs or anything in the simple syrup container. Whenever you need to use your simple syrup, transfer it to a different bowl so the brush that you are using won’t leave crumbs in your whole batch. 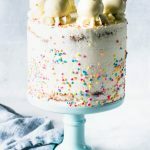 I have plenty of tips on how to make Italian Meringue Buttercream in this post about my Lemon Coconut Layer Cake. And I wouldn’t mind if this Strawberry Rhubarb Almond Cake was my birthday cake either. 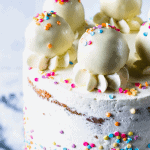 For more cake recipes, check this page out. I hope you have a lovely day! As always, thanks for reading! 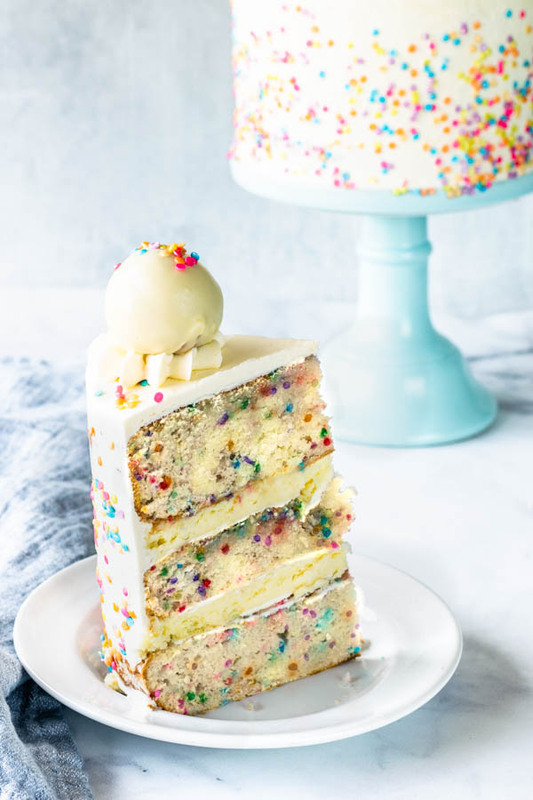 Birthday Sprinkles Cake. With Cheesecake filling. Covered in Italian Meringue Buttercream. 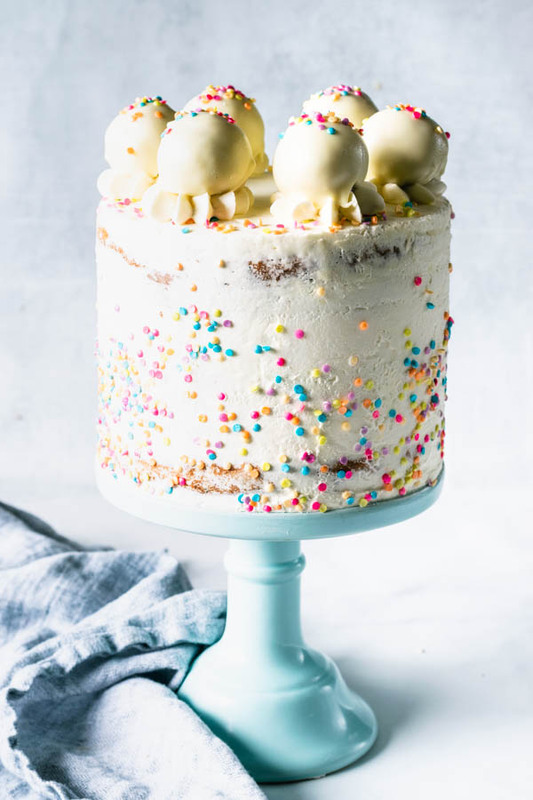 Topped with Sprinkles White Chocolate Truffles. Pre-heat oven to 350F. Grease and line with parchment paper, the bottom of 3-6” cake pans. Or you may use 2-8” pans, but your cake will be shorter. Start by sifting the flour, baking powder, and salt in a bowl. Set aside. Add oil and keep mixing. Slowly add sugar in, with mixer on medium. Scrape sides of the bowl. Mix on high for 30 seconds. Add 1/3 of the flour mixture to the pan. Stir until just combined. Add 1/2 of the milk in. Again, stir until just combined. Add another 1/3 of the flour mixture to the pan. Stir carefully. Now follow with the last half of the milk. And finally, add the remaining flour. Fold slowly, being careful to not overmix your batter. Set batter aside for a couple of minutes. Whip egg whites on high speed in an electric mixer, for about 3 minutes, or until stiff peaks form. Fold egg whites into batter in two parts. Add the second part after the first has been incorporated. Finally add sprinkles and mix as little as possible. Divide cake evenly between pans. Bake for 15-20 minutes, checking every 5 minutes after the first 10 minutes have elapsed. Rotate pans for even baking. Remove from the oven and let cakes cool down for 10 minutes. Flip cakes onto a cooling wire. I like to make my cakes in advance and refrigerate them, so they are easier to manipulate during the decorating time. Pre-heat oven to 350F. You will need 2-6” cake pans, or just a 8” one. Depends on the size you make the cake. Use the same size for the cheesecake. Start by creaming the cream cheese in the bowl of an electric mixer, at medium-high speed, for about 2 minutes. Add sour cream. Cream for another minute. Slowly add the sugar in, with the mixer running on medium speed. Add eggs, one at a time, being careful to incorporate one egg before adding the other one. Place pans on a baking sheet. Insert baking sheet into pre-heat oven. Pour about 1 inch of water on the bottom of the baking sheet. Creating a water bath for the cheesecake. Baking time will vary depending on what size pan you decided to use. You will need more time to bake the 8” one. For the 6” ones it took me about 20-25 minutes. Remove from the oven once cakes are firm but slightly jiggly, and also slightly browned on top. And when you touch the top of the cakes, delicately, they spring right back. Let cheesecake cool down. Using a knife, try to loosen the bottom of the cheesecakes slightly. Place cheesecake in the fridge. Let it set before taking it out of the pan, or it may break. STORAGE: You can store the Italian Meringue Buttercream for up to 1 day at room temperature. It will keep great in the fridge for up to 5 days. Or, you may store any leftovers in the freezer for up to 2 months. If you kept your buttercream in the freezer, or fridge, let it come to room temperature and whip it with a mixer to restore the fluffiness before using it again. Brush simple syrup on the first cake layer. Spread a very small amount of frosting on top of cake layer. Place cheesecake on top. Top with the next layer. Brush simple syrup on layer. Spread a very thin amount of frosting on top of the cake. Place the other cheesecake on top. Now top with the final cake layer. Brush simple syrup on top of the layer, if you want to. Cover with a crumb coat. Let cake rest in the fridge, then proceed to frost the cake. To get the sprinkles to go on the cake like that, I used a technique I found somewhere online. I sprayed some oil spray on a parchment paper. Sprinkled some sprinkles on top of the sprayed area. Then carefully placed it on the side of the cake, pressing gently to make sprinkles stick. I liked this technique a lot, next time I will apply less pressure not to damage the cake so much. Also, I would place cake in the refrigerator for about 5 minutes before doing that, so the frosting is slightly firm. Recipe for the truffles can be found here. You may brush simple syrup on your cakes before baking. To make simple syrup, simply bring to a boil equal amounts of water and sugar. Let syrup cool down before using it to brush cakes. I always have simple syrup in my fridge, because I make a big batch and then store it in a glass container inside of my fridge. It lasts indefinitely, as long as you don’t let any cake crumbs into the syrup. Esse é o tipo de bolo que comemos com os olhos, a dedicação nos detalhes que você tem é que faz toda diferença, parabéns por mais essa obra prima!!!!! Muito obrigada pai! Te amo! ohhh! 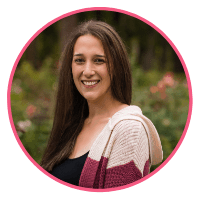 maybe because my newsletter was set up wrong before!! Thank you Patrick!! Have a happy August!! Wow, this cake is CUTE.CUTE.CUTE. I love all the colorful sprinkles! I would love to make this for my daughter I bet she would adore it. Thank you I am so glad you like my sprinkles cake!! Thank you Dawn, you’re the best!! this is seriously adorable and fun I would love to have someone make me a cake like this. As soon as I saw it , this made me smile from ear to ear. Claudia, you’re always so sweet! ahah thats pretty much what I did!